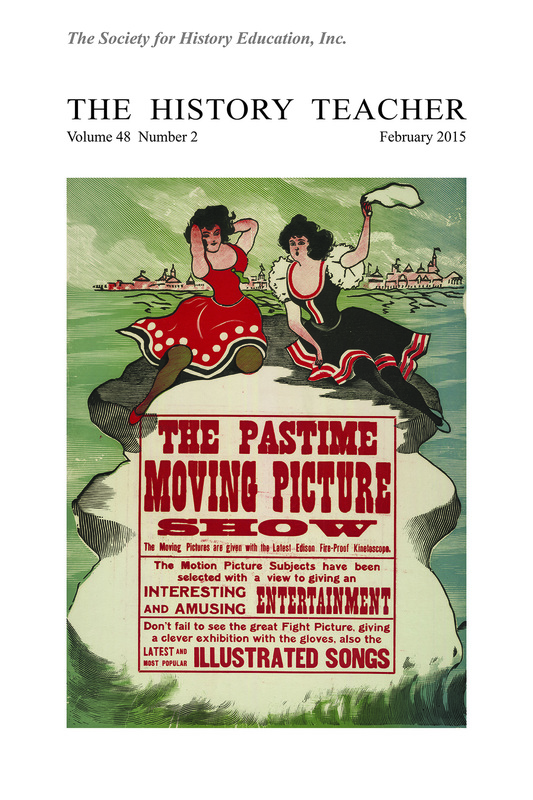 February 2015 Front Cover: The Pastime Moving Picture Show. 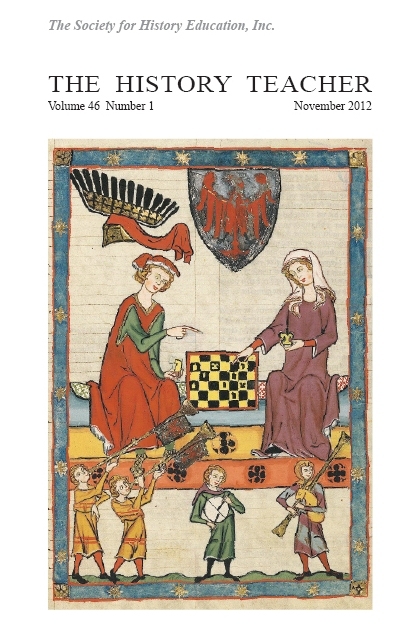 Lithograph by unknown creator, 1913. Library of Congress, Prints and Photographs Division, LC-DIG-ppmsc-03750. https://www.loc.gov/pictures/item/2007676115/. 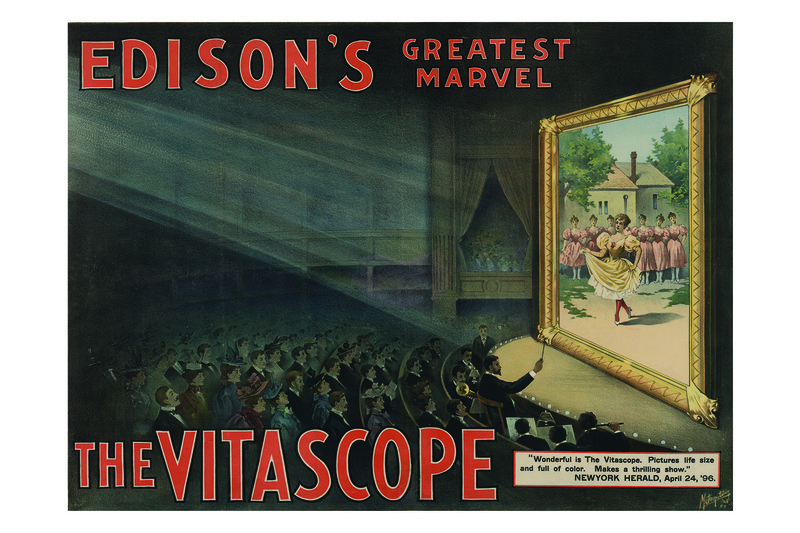 Back Cover: Edison's Greatest Marvel—The Vitascope. Lithograph copyrighted by Metropolitan Print Company, New York, 1896. Library of Congress, Prints and Photographs Division, LC-DIGppmsca-05943. https://www.loc.gov/pictures/item/2003689462/. 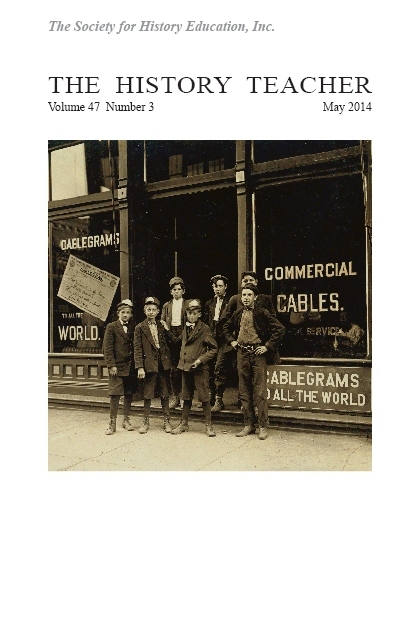 Thomas Edison's two advertisements for moving pictures center upon depictions of women, but student historians can investigate these illustrations to raise a variety of historical questions. 1896's "Greatest Marvel," the Vitascope, projects larger-than-life women dancing on screen while live musicians perform for a well-dressed audience. Less than two decades later, a pair of women posing beachfront in bathing suits overshadow descriptions of 1913's "Latest Edison," the new—and apparently improved—"Fire-Proof" Kinetoscope. 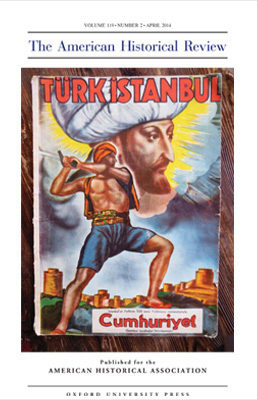 These early movies promised entertainment with the "great Fight Picture" and the "latest and most popular Illustrated Songs"—media that may be familiar to students despite these documents being over a century old. Motion pictures have since developed in their technology and ability to tell stories—both fiction and non-fiction. 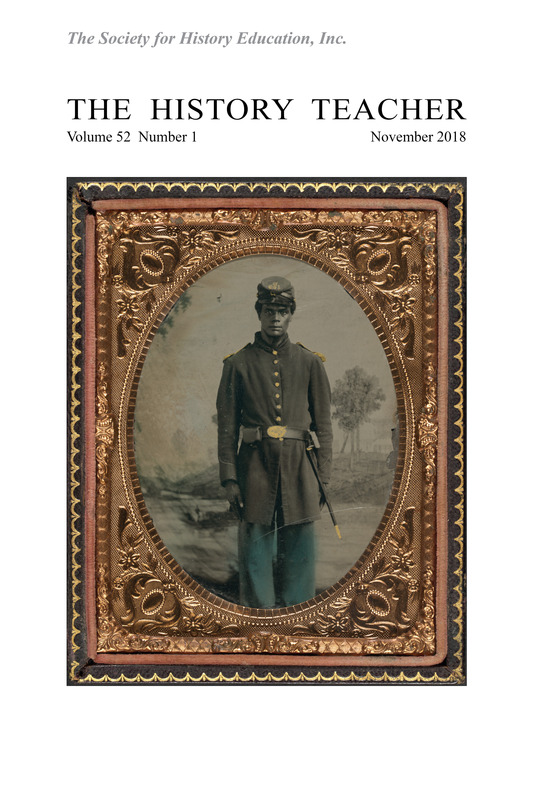 This issue of The History Teacher features several articles on using illustrated and image-based sources—including pictures and motion pictures—as text in the history classroom. Kurt Clausen (Ph.D., University of Ottawa) has taught elementary through postsecondary grades, and is now a tenured Professor at the Schulich School of Education, Nipissing University in North Bay, Ontario, Canada. Clausen's work centers on the History of Education in Canada, particularly curriculum development in Ontario. Heather Coffey is an Assistant Professor in the Department of Middle, Secondary, and K-12 Education at the University of North Carolina at Charlotte. She currently teaches English methods and the engagement curriculum for first-year college students who have an interest in education. Coffey earned a Ph.D. in Education from the University of North Carolina at Chapel Hill and has published journal articles and book chapters related to critical literacy, multicultural education, and service learning in teacher preparation programs. William Boerman-Cornell holds a Ph.D. in Language, Literacy, and Culture from the University of Illinois at Chicago. He is an Associate Professor of Education at Trinity Christian College in Palos Heights, Illinois. His work has been published in Educational Leadership, the International Journal of Comic Art, and Bookbird. He has presented his research at a joint panel of the American Historical Association and the Society for the History of Authorship, Reading, and Publishing. Paul G. Fitchett (Ed.D., University of North Carolina at Chapel Hill) is an Associate Professor of Education in the Department of Middle, Secondary, and K-12 Education at the University of North Carolina at Charlotte. His research interests include the intersections of policy, teacher decision making, and student learning in history education. He has published in Theory & Research in Social Education, The Journal of Social Studies Research, and Teachers College Record. Walter E. Grunden is an Associate Professor at Bowling Green State University, teaching courses on Japanese history, modern China, and U.S. military history. His research focuses on science and technology policy. He is the author of Secret Weapons and World War II: Japan in the Shadow of Big Science (Lawrence, KS: University Press of Kansas, 2005). J. Laurence Hare is an Assistant Professor and Director of Undergraduate Studies in History at the University of Arkansas. Previously, he was a Visiting Assistant Professor and Director of Freshman Humanities at Emory & Henry College. He earned his Ph.D. from the University of North Carolina at Chapel Hill in 2007. His book, Excavating Nations: Archaeology, Museums, and the German-Danish Borderlands, is forthcoming from the University of Toronto Press. Alison Hicks is the Romance Language Librarian at the University of Colorado, Boulder. She has an M.A. in French and Spanish and an M.S. in Information Studies (MSIS). Prior to taking this position in Colorado, she worked as a librarian at the Inter-American Development Bank, Washington D.C. and the Antarctic Treaty Secretariat, Buenos Aires. Her research interests include critical information literacies and changing digital scholarship practices. Susanne Hillman earned her Ph.D. in History from the University of California, San Diego in 2011 and has since continued as a Lecturer in modern European history. As the project manager of the Holocaust Living History Workshop, she works extensively with video testimony and has consistently incorporated it into her teaching. Her research on German-Jewish and women's history has been published in various academic journals, including German Studies Review, Journal of the History of Ideas, and Soundings. Todd A. Horton (Ph.D., University of British Columbia) is a tenured Professor at the Schulich School of Education, Nipissing University in North Bay, Ontario, Canada. His research interests and publications are focused on analyzing and comparing concepts as evidenced in curriculum documents, and the use of popular culture in history education. Horton has taught at various levels, from elementary through post-secondary school. Adrian Howkins (Ph.D., University of Texas at Austin) is an Assistant Professor of International Environmental History at Colorado State University. He has published a number of articles on the history of Antarctica and is finishing a book manuscript on an environmental history of the Antarctica Peninsula. He is Co-Principal Investigator on the McMurdo Dry Valleys Long-Term Ecological Research (MCM LTER) site, where he is working to integrate the fields of history and ecology (www.mcmlter.org). Sarah A. Mathews is a Visiting Assistant Professor of Social Studies Education in the Department of Teaching and Learning at Florida International University in Miami, teaching undergraduate social studies methods courses and graduate courses related to research methodology and curriculum theory. Mathews focuses on social studies teacher education with an emphasis on global and multicultural education. Particular interests include intercultural education, media, out-of-school literacies, and visual arts. Lisa Merriweather is an Assistant Professor in the Department of Educational Leadership at the University of North Carolina at Charlotte. She received her Ph.D. in Adult Education from the University of Georgia, and is interested in equity and social justice in adult, informal, and doctoral education. Recent projects include service learning among under-represented racial populations, culturally responsive mentoring addressing "othering," and orality as informal learning in African American communities. Rachel Pawlowicz is a graduate student in the Master's Degree Program in the Department of History at Bowling Green State University, with additional interests in education and philosophy. Her work was recognized as one of the best advanced history research seminar papers at the annual History Research Symposium at Bowling Green State University. 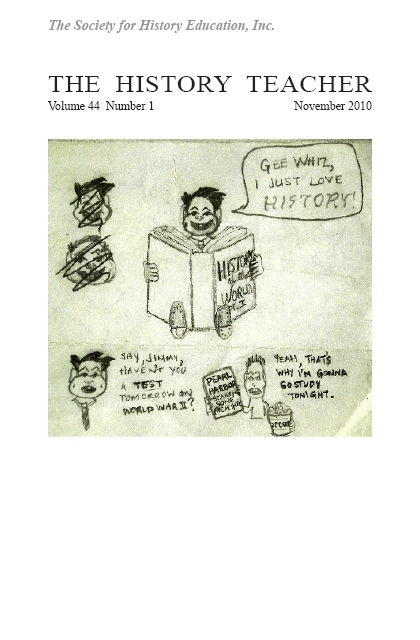 Jack Wells is an Associate Professor of History and Director of the College Core Curriculum at Emory & Henry College. An expert on the history of the ancient Mediterranean, Wells earned a Ph.D. from Ohio State University in 2004. He is currently working on a manuscript exploring the intersection of religion and politics in the first century B.C.E. through an examination of the rivalry between Cicero and P. Clodius Pulcher.